Good technique for darning socks neatly by Cookie A.
NB not yet tried it: link saved for future reference. 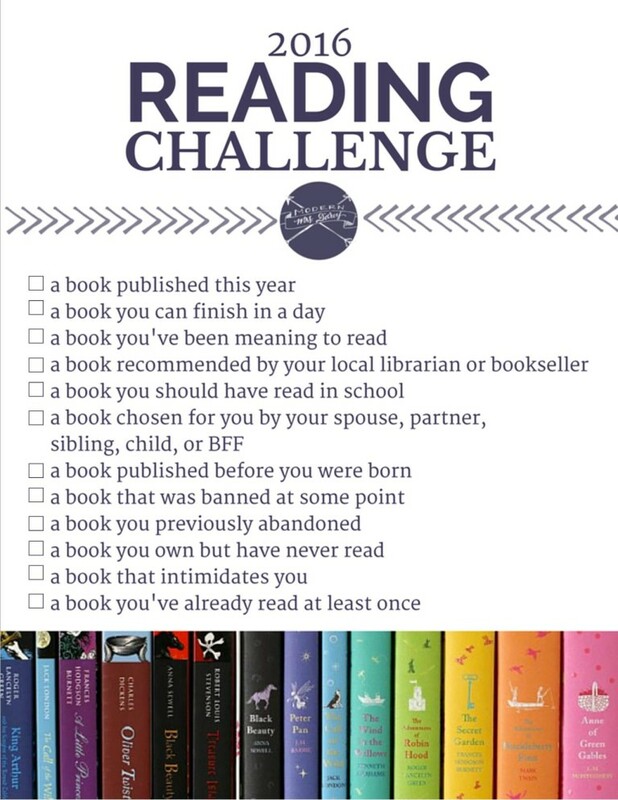 Remember the reading challenge I mentioned last month? After a trip to the library this afternoon, I have completed one of the challenges. A book you can read in a day – According to Yes by Dawn French, a very funny novel, with some of the best swearing I have read. It has something to say about families and how easy it is to become disfunctional. I’m also continuing to rack up the re-reads, in the absence of knitting. I’m on the fourth installment of Diana Gabaldon’s Outlander Series, having begun from the beginning. My thumb has got worse again this week, so I’ll be back off to the doctor again soon. However, I’ve been doing a very small amount of practice at continental knitting, which doesn’t involve moving that thumb very much at all. I bought a very useful craftsy class that shows exactly how to hold the yarn and move the fingers. I keep adding to the list of things I shouldn’t do because it aggravates the tendons. Today I added “clean stove”: a great excuse to avoid housework. A good video and free booklet about hand exercises to make knitting less painful. 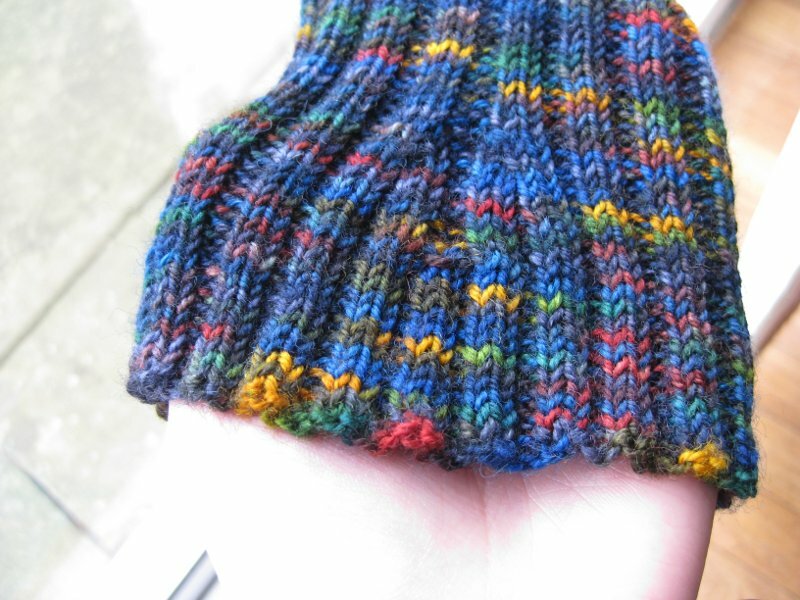 I’m enjoying this series of posts linking knitting with various computational concepts. I’m back from holiday now, with a few inches of Trillian knitted and I’ve got to the first heel turn of the heavily cabled socks. Is it an item that you would recommend to others, and if so for which applications/tasks do you think it is most suited. Conversely, do you have a tool/accessory that you regret buying? Why does it not work for you? Over the last few years, I have collected many different tools for knitting, all of which I would recommend. Without question, the tools that make the biggest difference to my craft are my ball-winder and swift. I’ve had the ball-winder for some years, (although it appears I have never taken a photo of it and the light is too bad to take one now – go here and scroll all the way to the bottom of the page), bought the first time I went to the Knitting and Stitching Show from the Texere Yarns stand. 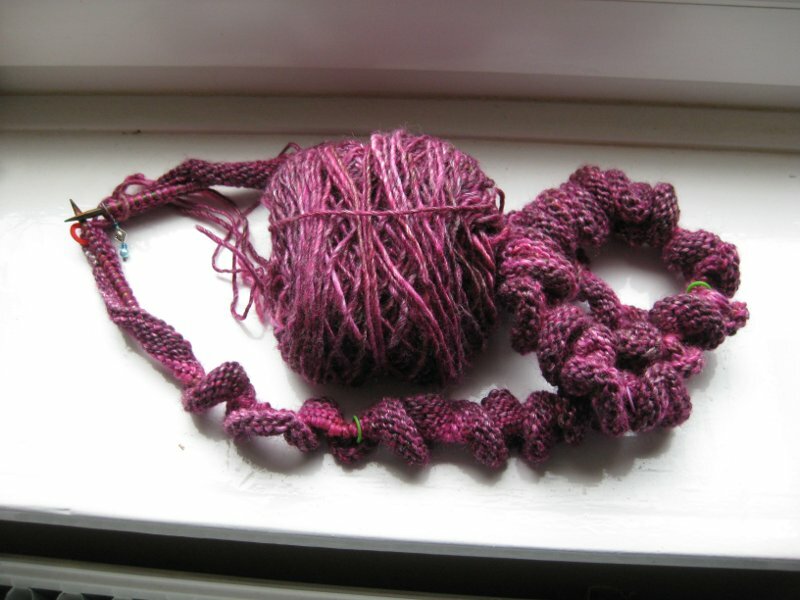 Before the ball-winder arrived, I had wound a couple of skeins into balls, but found it tricky, particularly the need to compel someone to remain on the sofa, holding a skein of yarn over their outstretched hands. After the ball-winder it was undoubtedly easier to wind skeins with the assistance of someone to hold the skein tight, but it could be done with some judiciously placed chairs instead if necessary. Still, nearly every skein ended up in a big knot at some point in the process. 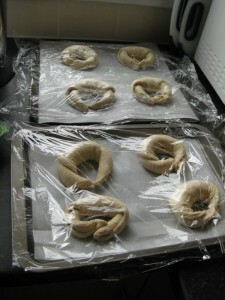 Even knowing that the knot must be a slip knot and therefore unravellable, doesn’t make it any less tedious. Eventually, I bought a swift, a beautiful wooden one that collapses into a fairly small box. It is the Amish-design Wooden Yarn Swift from Chiaogoo. 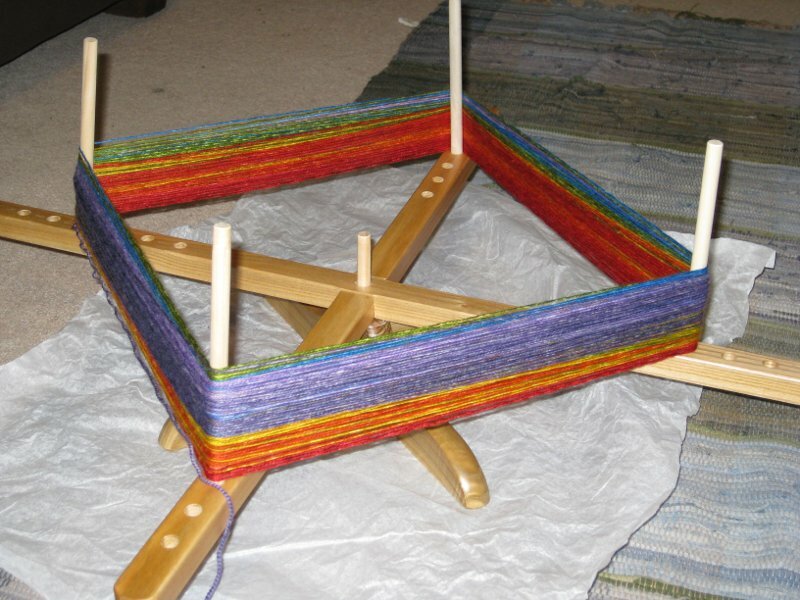 It is still fairly new, so doesn’t run as smoothly or easily as I would like, but it makes it very easy to wind yarn, with no other human required to hold it. 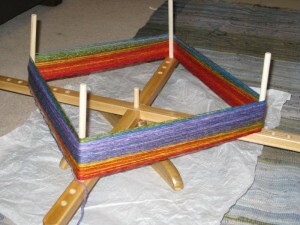 I spend whole evenings with the swift and ball winder out, winding yarn in front of the tv. It works perfectly for thicker yarns, but for thinner yarns (sock and lace) I often have to tension it by hand to avoid it being wound too tight. My son is now at the age where he thinks a ball winder is a wonderful toy and he can often be persuaded to turn the handle of the ball winder for me, with some encouragement and a reminder to stay at the same speed and winding in the same direction. You get some horrible snarls if you start going the other way and a loop of yarn catches in the cogs underneath. 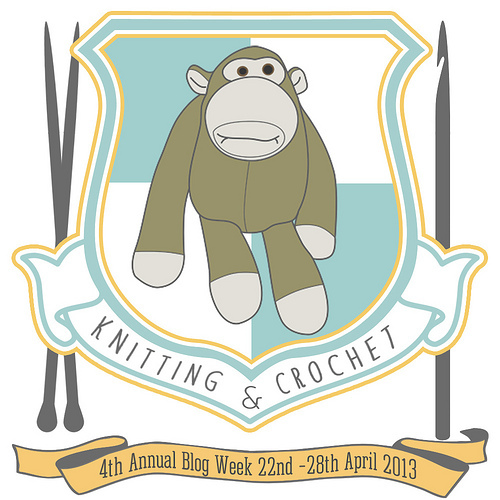 Any knitting tools I regret buying? Just the very short (10 cm) sock needles I bought last autumn. I hold my needles in the gap between my thumbs and forefingers. The short needles just poke holes in the skin. 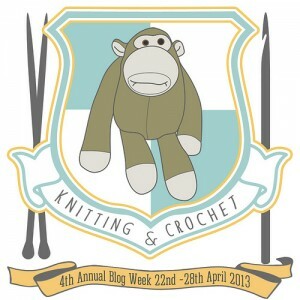 On the whole, I love knitting tools and I’m sure I will acquire more of them in the future. When it comes right down to it though, they are peripheral to the action of just sitting and knitting with good yarn and needles that feel right. P.S. 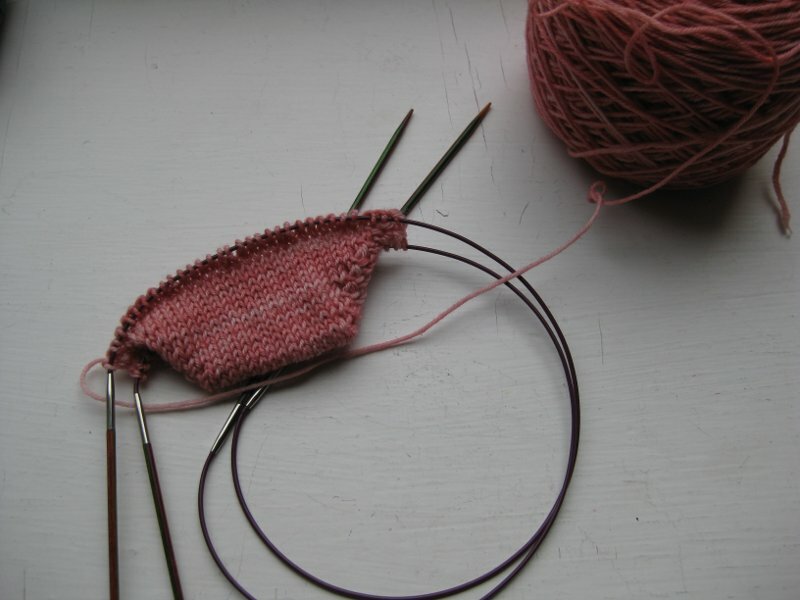 I took one of the pink socks to a work meeting on Thursday evening and was sitting there quite happily knitting my way up the lace chart when the cable of my circular needle caught on a button on my coat. I didn’t notice, reached out for something and then discovered I had neatly removed the needle from the stitches, depositing stitch markers in the darkness under the seat. It all ended happily at home later that evening (I was able to grovel on the floor and find all the stitch markers) and I fixed the lace with only one round of tinking. Maybe I need to take simpler knitting to meetings. 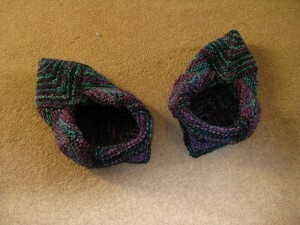 A while back, I knitted some slippers. They are cunningly made from a handful of mitred squares, but they were too big and too floppy. They didn’t stay on my feet, so were a bit rubbish in terms of their intended function. I decided to keep them in case I ever figured out what to do with them. As I read more about knitting, I realised that they are made from 100% wool (Colinette Hullaballoo), so are candidates for felting. I wasn’t sure how to go about felting them, so just ignored them for a while. This week, my current pair of slippers fell apart and my feet were cold, so the need was urgent. I tied the knitted slippers up in a pillowcase (I’ve read the Yarn Harlot – I do not want to block the washer pump with stray fibre), added Ecover laundry liquid and put them on for a 40 degree normal wash. 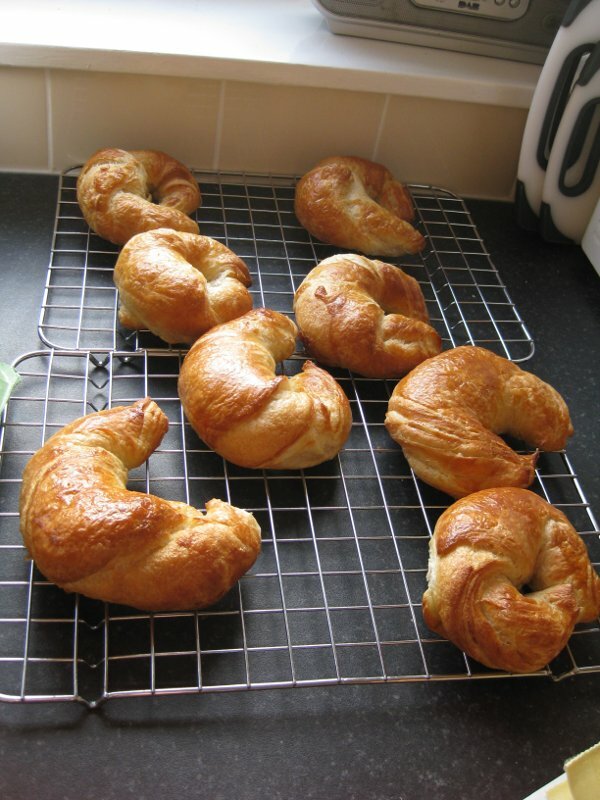 They came out significantly smaller and much more rigid. Just as I wanted. A few hours drying on a radiator and they were ready. I think I shall get some non-slip stick-on bits for the soles, although I quite enjoy skating round on our hard floors. 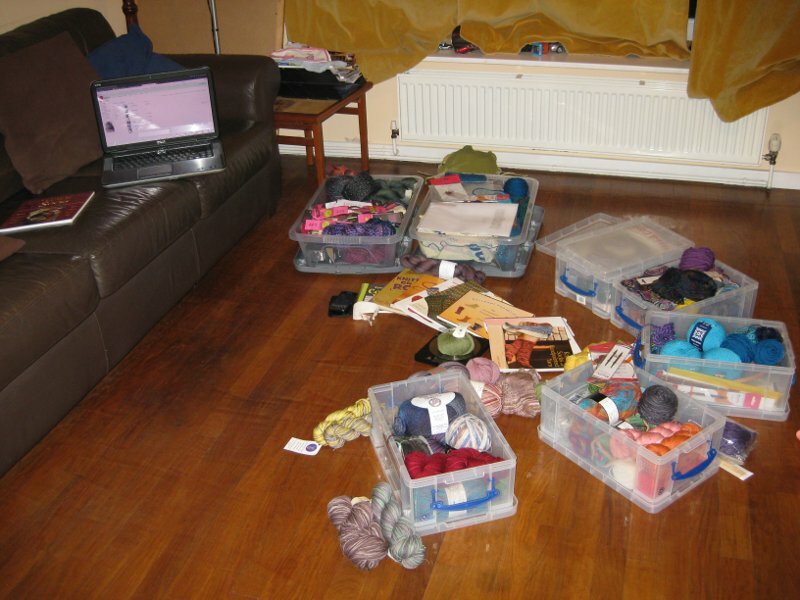 The previous post, while full of news, was somewhat lacking in pictures. Let’s see if we can change that. 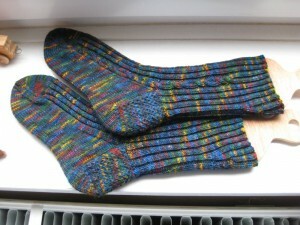 Here are the socks that I finished for Mr H. These are full of firsts: the first socks I’ve knitted for him, and in fact the first socks intended to be worn by a man. They are also the first socks with calf shaping that I’ve knitted and the first socks I’ve designed, although they are a fairly simple design. The cast-on is JSSCO, which matches JSSBO in looks. I have to say that I am not a huge fan of this cast-on. 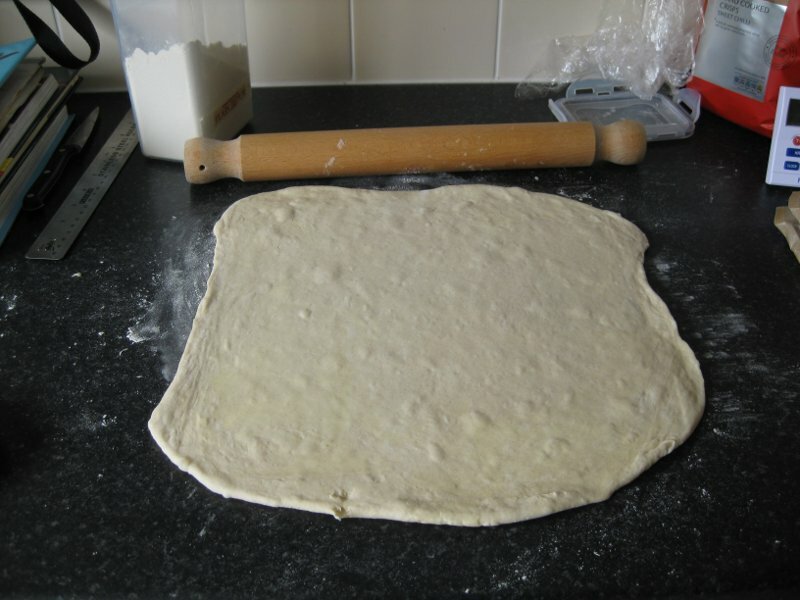 It is very clever and does the job nicely, but is a real faff to get right. It is constructed using slip-knots and I was never completely happy with how it turned out on the needle. The main part of the sock is in 2×2 rib. The calf shaping was constructed to make the most of this and I’m fairly happy with how it turned out. I put a cable down the outside of each sock, just to add some interest to what promised to be a very dull pair indeed. 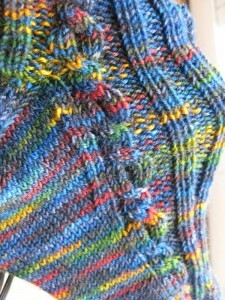 The heel construction is my usual heel-flap and gusset, using eye of partridge on the flap. The cable just skirts the heel and continues down the foot. On the first sock, the cable merges a bit too much into the plain sole so I added an extra purl column to separate them on the second sock. Onto current projects. 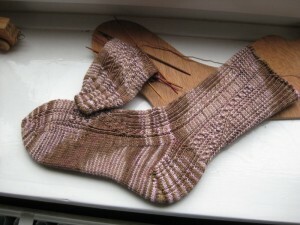 These are the Sapient Pearwood Socks from last year’s Knitting Goddess When Granny Weatherwax Knits Socks club. They are nominally my January socks, but look like being my February socks as well, thanks to the new job and sundry other distractions. 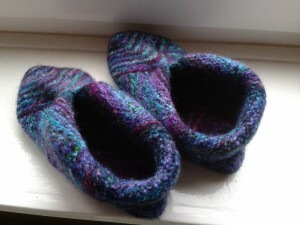 When complete, they will go to Anne, who requested a pair of knitted socks. 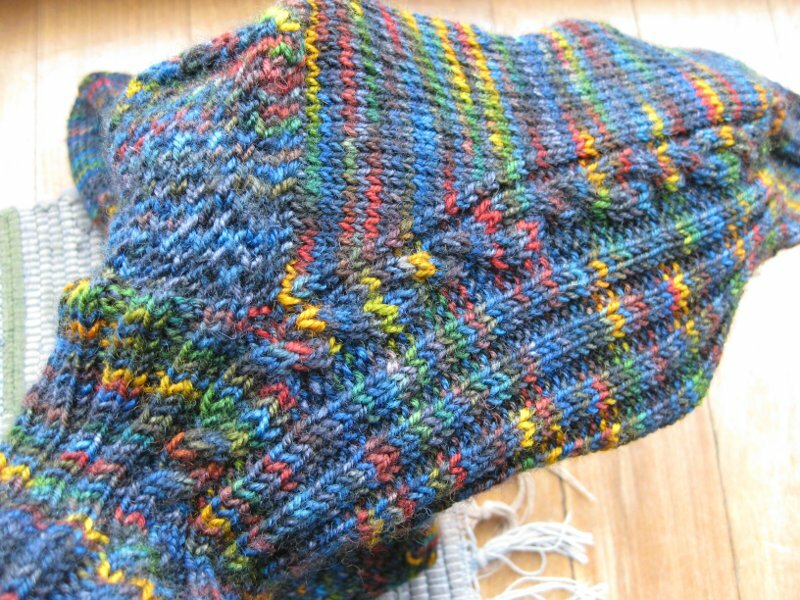 Great pattern, with twisted stitches and mini-cables. I’m now charging up the second sock since I’ve memorised most of the pattern. Really nice toe-up construction that looks like a top down heel-flap. Can’t actually remember how it was done, but I liked it! 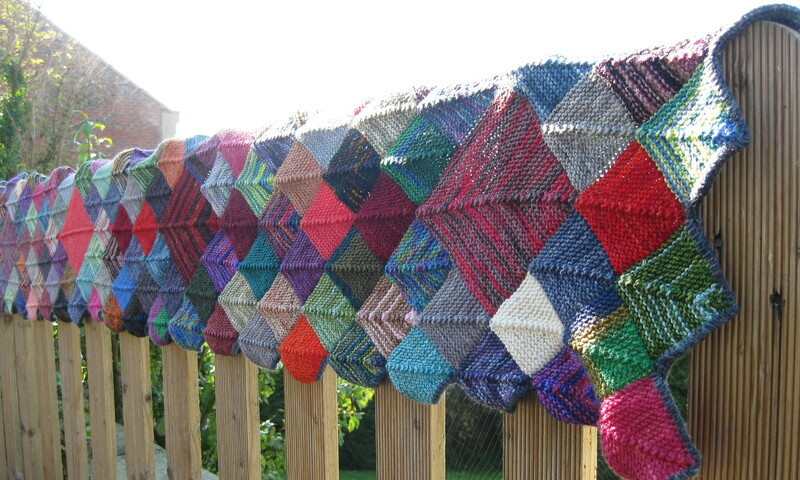 I’m knitting these on dpns just for a change. I tried some of the very short (10cm) dpns, but they don’t suit my style at all, just poke me constantly in the thumbs, so I went back to my trusty set of Knit Pro Harmony dpns. Finally, here is the start of my swirl. Doesn’t look like much of anything yet, but it is growing slowly. I’ve had to order a replacement cable for my interchangeable needles after a pulled one apart while trying to move the stitches round the needle. If this cast-on was twisted I will be very cross indeed. I’ve checked it and checked it, but can’t be sure since I can’t see it all in its non-squished-up state. I do now have cable connectors (from the lovely people at Sanday Spinners) so I might put it onto a much longer needle to check it out.